Progressive International is your source for the widest range of functional, inventive, and fun kitchen tools and great ideas put into practice. 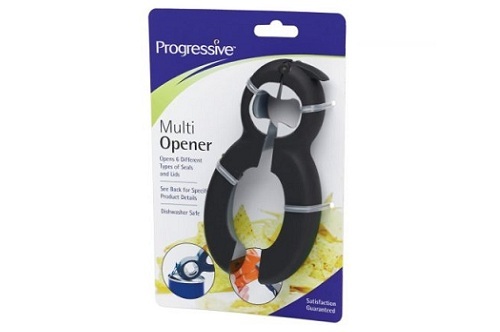 This unique opener opens 6 different seals and lids. It has a hidden blade that zips open bags, and a clamp that opens safety seals. 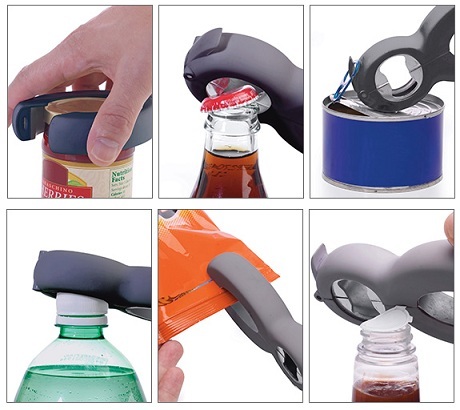 For beverages use the pull tab opener, pops off a bottle cap, or opens screw caps. It can also be used for opening jar lids. It is durable, has a comfort grip and is dishwasher safe. Price: $10.49 & eligible for FREE Shipping on orders over $25.